WWII German Panzerschreck Rocket Ammunition Crate - Painted Flat Black - Summer Markings. 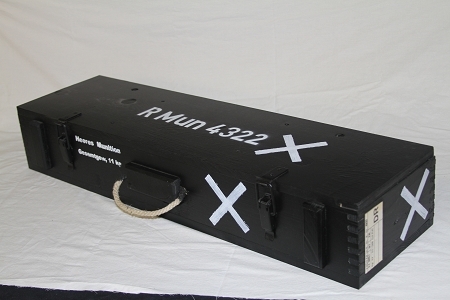 This crate was used to transport two anti-armor rocket ammunition rounds for the "Raketenpanzerbüchse", or Panzerschreck. All details from our original crate have been faithfully reproduced here. Explanation of external marking: The rocket fuel used to propel this munition was affected by the ambient temperature. Due to this factor, ammunition was seasonal. 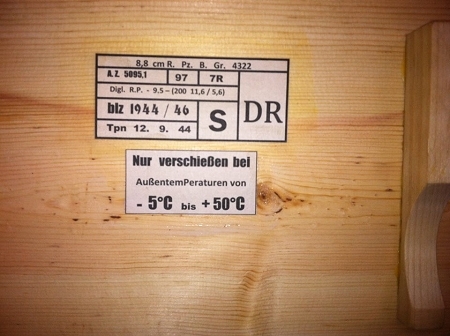 Crates marked with "X" on the exterior are "summer/fall" rated. Crates marked with an "O" are "winter/spring" rated. There is also a paper label inside the lid stating the effective temperature range of the rocket. WWII German 8cm Mortar Ammo Crate, 3 Rounds, Bare.